An inspiring new video from smartMeme with leaders from frontline communities and allies talking about the Copenhagen moment. African negotiators at the U.N. climate talks in Barcelona just refused to continue formal discussions about all other issues until wealthy countries live up to their legal and moral responsibility to commit to deep emissions reductions. Rich countries (also called “Annex 1 countries”) have ground negotiations to a halt by failing to agree their new targets under the Kyoto Protocol (KP), driving developing countries to put their feet down. This walkout is significant and opens up political space – it means many of the countries in Africa just stopped one half of the UN climate negotiation process until rich countries say how much they will reduce their carbon. We’re down to the wire: just four negotiating days left before the big agreement in Copenhagen is supposed to go down. Its day one, and we saw just a taste of the breakdowns to come. While rich countries continue to undermine commitments for the Kyoto Protocol (one of two negotiating tracks for Copenhagen which is supposed to be renewed for a second commitment period of Annex 1 targets), the spin has already taken hold: they’re blaming Africa for their own delay-mongering. Oy vey. In response, movement and civil society organizations held a demonstration at the U.N. building in support of African delegates’ insistence that developed countries commit to new, strong binding targets. 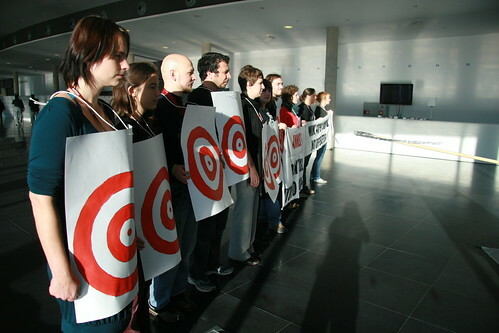 Delegates and observers were invited to join a human shield against the killing of Kyoto targets (complete with an Annex 1 grim reaper) and instead urged to promote at least 40% emission reductions with no offsets by 2020. Today marked one of the final days of the Bangkok UN Climate Negotiations. With the end of this intersessional in sight, the International Youth Delegation (IYD) has officially declared “No Confidence” in the road to Copenhagen. 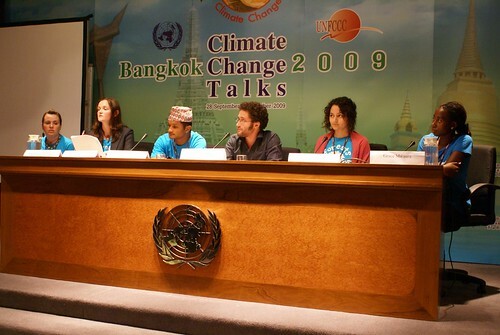 With youth delegates from over 30 countries engaging in the Bangkok process, the IYD cited pathetically weak targets from the North, alarm that a second commitment period in the Kyoto Protocol will not be secured, and a lack of guarantees for protection of Indigenous peoples’ rights and interests, in its Declaration. The current text of the draft climate deal is so weak and so full of “false solutions” (measures like offsetting that actually make the problem worse) it is unacceptable. Youth delegates representing each continent addressed the U.N. today, detailing the urgency of the crisis as it affects their communities currently, telling stories of their hope and organizing alongside their denunciation of the state of play in the UN Negotiations. This week the Annex 1 (rich countries), attempted to kill the Kyoto Protocol (KP). We are nearing upon the end of the current KP term, and a lack of renewing it means that the world would lose the few legally binding international climate agreements it has (as insufficient as they are). The excuse is that the United States will not sign, and therefore the whole thing should be scrapped and an entirely new deal can be struck on its own. It is lunacy to think that this will yield a stronger outcome, and the G77 (the rest of the world) countries are furious. We have always known the US wont sign the KP; the world cannot continue to wait for the US to get on board. In Bali, the U.S. already committed to setting comparable targets to other Annex 1 countries, so the world could deal with the U.S. in the LCA (Long Term Cooperative Action). This all amounts to a shell game: more dirty delaying tactics from self-interested countries who are content to strip away basic attempts at an international agreement (for example “compliance” – meaning that the U.S. would have international oversight of its targets, or “top-down target setting” – meaning the international community sets carbon targets together based on science, rather than each countries independently setting their targets based on what their fossil fuel extraction industries dictate). Allowing the U.S. to drag the world out of existing legal obligations is disgraceful. These negotiations are going backwards. Make no mistake: Our future is being held hostage to interests that have consistently thumbed their noses at the international community and their obligations to the rest of the world. This process has been polluted by self-interested corporations and nations looking to profit off of our crisis. They have been pushing false solutions that exacerbate rather than fix the problem. Not only are the targets set by rich countries weak, but they are deceptive. Rather than representing actual emissions reductions, they contain unacceptable proportions of offsets, which do not reduce emissions, and displace the burden back onto the developing countries of the world. Coming right off the heels of the UN General Assembly in New York and the G20 in Pittsburgh, the world has taken its next step on the road to Copenhagen: the Bangkok round of negotiations for the United Nations Framework Convention on Climate Change (UNFCCC). With an invigorated sense of skepticism, civil society, governments, and of course business interests are here to try to hammer through obtuse and contradictory text to create something that can be of some use on the table at the Copenhagen meetings this December. The UN press office was quick to hand me a defensive-sounding media release stating ‘Negotiations set to pick up in Bangkok as a result of New York Climate Change Summit’ – hoping to put a positive spin on the process. Sure, the New York summit yielded lots of big talk about Climate – unfortunately very little in the way of meaningful targets and commitments, as pointed out (to much applause) by a Sudanese delegate this morning. On the flip side, many people here in Bangkok have been encouraged by China’s announcement at the NY summit that it is increasing commitments on carbon reduction. We all know though, that responsibility to lead with these negotiations lies on the global North to make bolder and serious commitments. India and China are moving, and the classic US approach trying to pin blame on them is increasingly seen as excuse-mongering even to those who may have bought the line before. From where we stand now, it looks like Copenhagen will be a greenwash. But civil society here in Bangkok is not taking this as a moment to despair but as a higher call to action for just and equitable ways to meet meaningful targets. Peoples movements and activist networks from across the globe are taking this opportunity to build and organize, invigorating local solutions back home, regardless of what ends up on the negotiating table. And so we keep pushing. If we temper our ambition along with our expectations, governments will feel more emboldened to backslide and allow the treaty to be an industry giveaway. Lets keep pressure up. It’s day four of the United Nations Framework Convention on Climate Change (UNFCCC) negotiations in Poznan Poland, but it feels like I’ve been here for months. I’m up before the sun rises and in bed after midnight – and the action is nonstop. I with 500 youth delegates here from over 54 countries across the globe, from India to Peru, to Australia. Young people have been meeting with governments, participating in negotiations, harassing corporations, training each other in everything from climate justice to organizing skills, and speaking clearly and loudly: young people are collaborating across borders and have a shared vision. We want binding, equitable, science-based targets, and we’re going to fight for them. Our point was simple: the same people who have spent decades telling us they can’t afford to save our planet, can clearly move trillions of dollars within weeks (when their own pocketbooks are directly affected). The issue is not lack of resources, its lack of political will. Youth are demanding our governments invest in a strong green economy, our planet, and our future. Lucky for us, this economic crisis presents us with a wonderful opportunity. The opening day here in Poland, the UNFCCC said that the economic crisis is no excuse for inaction. We are saying that in fact, it’s the best reason in the world to invest in clean energy now, creating green jobs and sparking opportunity worldwide.